This week we sit down with Melissa owner of a small paper and creative goods company called PAGEFIFTYFIVE in beautiful Fort Collins, Colorado. 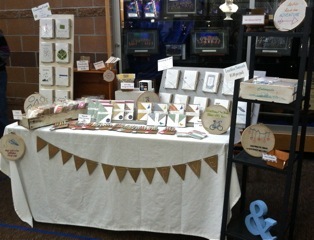 She designs and creates greeting cards, notecards, stationery, gift tags, paper goods and embroidery hoops! Melissa is such a fun and laid back gal (yet a super savvy creative business woman) I couldn’t wait to hear what she had to say! Hi Melissa! Explain to us your current line of creations and what was it that inspired you to start? 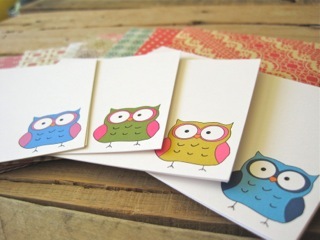 PAGEFIFTYFIVE is a small greeting card, stationery, papergoods and creative company. We revel in the simple, delight the quirky, and combine these two ideas to produce products that everyone will love! Our wish is that our products will make you smile, make your heart happy, and motivates you to pass that good feeling along! Recently, I have been focusing not only on my paper goods designs but also on my embroidery hoops. I love, love, love embroidery and am usually inspired to create a hoop from a card idea, or vice-versa. 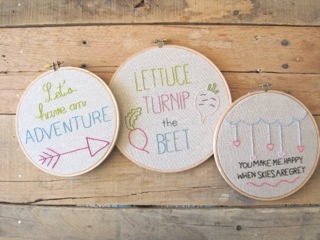 It’s another artistic outlet for me and I just absolutely love getting away from the computer and the hands-on process of taking floss, fabric and a wooden hoop and making a piece of wall art that someone will love. 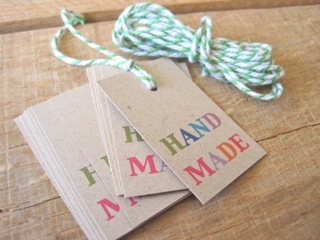 I am also working on a custom order for a floral design studio that consists of their marketing materials, gift tags, business cards, thank you cards, etc. I love it all! Tell us what makes your process unique? I’m not sure exactly makes my process unique because graphic design and embroidery has been around for a long time. But what I bring to the table…my ideas, my creations and my designs are what brings it a personality and makes me stand out from the rest. I have also self-taught myself all of what is now PAGEFIFTYFIVE. From actually learning to design and draw graphics on the computer, to learning about paper weights and textures and becoming business savvy. I come to this career with a BA in English and a Masters in Education…and here I sit loving my life and living the creative dream! Were you always creative as kid, or did you find it later in life? As a child, I was ALWAYS creative. Both of my grandparents were extremely talented and taught me so much that I use today. I can remember sitting on the kitchen floor at around 3 years old, making Christmas cards for my family (and a mess I’m sure). As a teenager, my grandpa showed me all there was to know about painting, woodworking, and card making. In the meantime, my grandma was teaching me how to sew, quilt and embroider. I was a very creative child and it really created who I am today! What is your favorite style of art and why? I love simple lines and am definitely a lover of minimalist, simple, quirky ideas. Custom order for a family that moved homes! 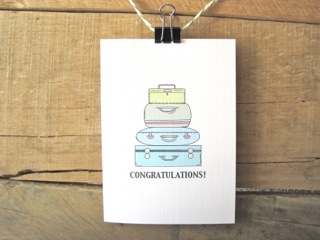 I turned it into a card and it’s now in the shop! How do you come about your ideas? Is there anything particular that inspires you? What is your favorite piece you’ve ever made and why? I love, love, love the new embroidery that I have been working on lately. Most of my embroidery starts out as a card design and I love it so much, I turn it into an embroidery hoop that can be hung in the house and enjoyed by all! 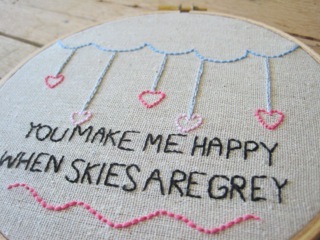 I think my favorite is the “you make me happy when skies are grey” embroidery that is currently in my Etsy shop. It just makes me smile. What’s the best compliment you have received about your work? My day is made and I am stunned every time I get an “out of the blue” compliment. Since opening my shop in September, I have been lucky to have a ton of support from my friends and family that purchase my art, love my art and pass it along to other people. I just recently received an email from another shop owner on Etsy who just wrote to tell me how much she loved my shop and said she was “speechless.” I feel so lucky when this sort of thing happens. 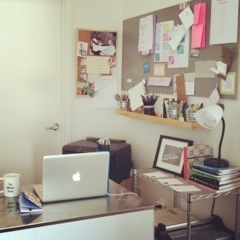 I love a clean, simple, minimalist workspace. That’s how I do my best work for sure. Sometimes that’s not always the case and I find myself buried in paper scraps, fabric, glue, bits of thread and paper corners. My friend always says when her bedroom is messy, it means she needs to give herself a time out and readjust some things in her life. I think this goes for me and my studio. If it’s a mess…odds are, I’m a bit of a mess and I need to chill out and reassess. Honestly, when you’re working full time in a creative field like I am, it seems like no two days are the same. This is a constant struggle for me. Seriously, would waking up at least in the same span of two hours hurt me?! haha. Seriously though…this is a day in the life of me. I wake up and head straight to the kitchen for coffee and breakfast. With coffee in hand, I head to the studio (aka spare bedroom in our house) and get to work. Typically, I putz around on FB, Etsy, Twitter, Pinterest, and blogs for about an hour. My day definitely varies depending on what orders I am working on, custom designs I have to complete, or designs bouncing around in my head…but my morning is usually full of work. NPR and podcasts get me through my morning. Having an iPhone is like having a little friend in the room with you In the afternoon, I always try to make it to the gym and post office. I think there are times that working alone in a studio all day gets lonely…it’s like a field trip when I go to the post office and gym. I can imagine that the people working at the post office may think I’m nuts for all the conversation I try to jam into the 3 minute transaction haha. Then the rest of the afternoon into evening is spent working! My goal is to try and end the day around 5:30/6. It doesn’t always happen…but it’s nice to give myself a little downtime at night. What are your interests or hobbies other than your work we have been discussing ? When I’m not creating new ideas for the shop, I am always consumed with another creative project. I dream up new DIY projects, I research new juicing recipes, I decorate our home with repurposed finds, I embroider quirky ideas onto hoops, I take adventures through novels, I dabble in photography (okay….mostly just obsess with Instagram), and do a bit of cooking and baking. I also love to ride my bike! I try to get most of my errands done on my bike as much as I can. It makes me feel alive! Is this your full time job, or do you have a job out-of-studio? This is it! It’s my full time job. Scary and exhilarating all at once! I’m truly living my dream. That is great! I’m sure lots of creatives reading this are dreaming of going full-time. Do you have any advice to give another artist to jump in? What is the best part of working for yourself? What is the worst? My best advice is, “fake it til you make it.” It can be really scary to own your own business and cut off the weekly paycheck, paid health insurance, paid time off things. But if you show that fear, or let it overpower you…it wins. I think just walk the walk until you own it. And one day, you look back and realize how amazing it is to truly be living your dream! What goals are you trying to accomplish right now? Describe any future goals you have. Oh my gosh…my goals are vast! I am a huge goal setter, have them posted on my idea board and constantly hold myself accountable to these goals. And I also love lists…so it’s a win win! 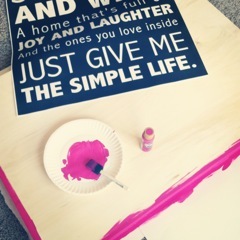 Ultimately, I want to live a simple, healthy, creative life…I’d say so far, so good. 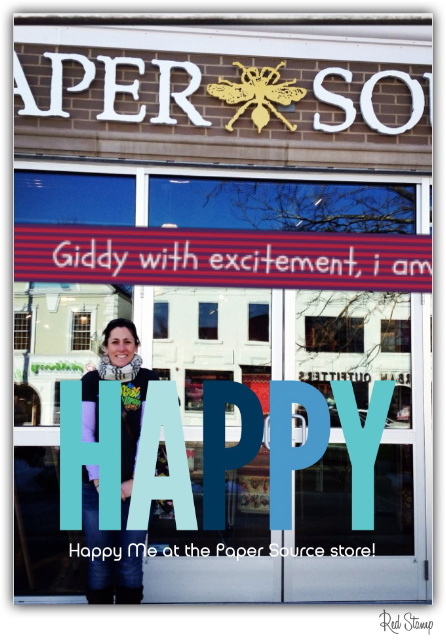 So there is PAGEFIFTYFIVE and a little about its creator Melissa! If you love her work and would like to purchase or want to find our a little more about her click on the following links! 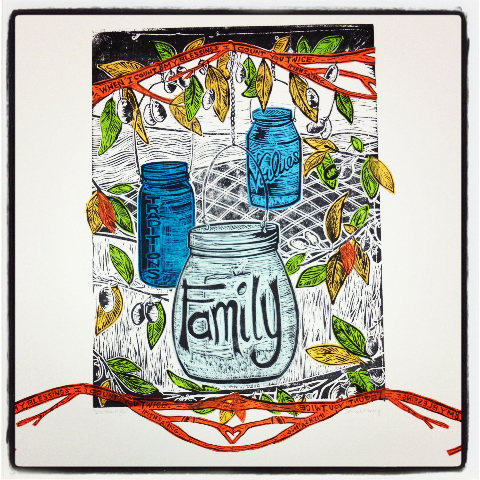 Today in my Fellow Artist Series I am featuring a Nashville local Author and Children’s illustrator Maggie Day Conran. 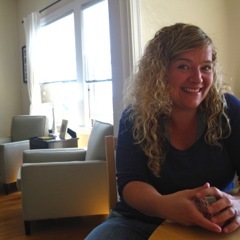 Maggie is known for her well written-witty-every mom can relate blog No Mommy Brain launched in 2007 which also appears in The Tennessean. 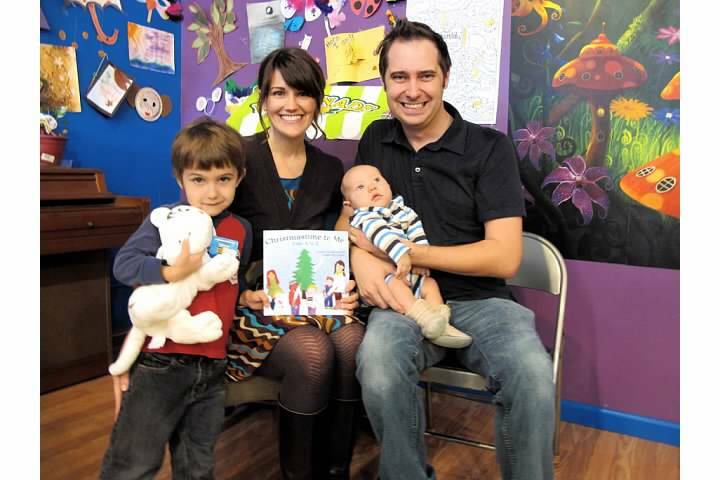 She calls East Nashville her home along with her husband and two sons where she creates paper craft as used in her book Christmastime from A-Z and illustrated Just Right Julia. Hi Maggie! I love your blog! Tell me about your current line of art creations? What inspired you to start? I make cut paper art, usually in the form of illustrations for children’s books. I got started a few years ago when I tried to make a simple ABC Christmas book for my son, Liam. Once I began cutting and pasting, the ideas started pouring out of me and the project took on a life of its own. 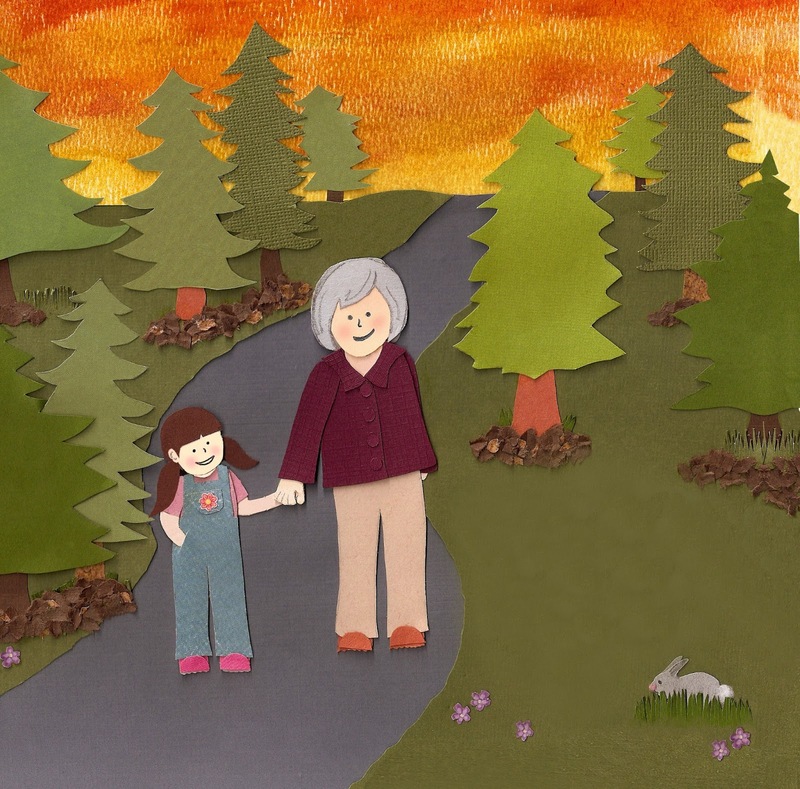 Now I love creating cut paper art – something I didn’t even know existed a few years ago! I’m not sure my process is unique! When I started, I chose this medium because it was the only way I could figure out how to make the ideas in my head come to life. It was only after I had been doing it for a while that I discovered there were other cut paper artists out there. From what I can tell, most people probably use fancier equipment than I do. 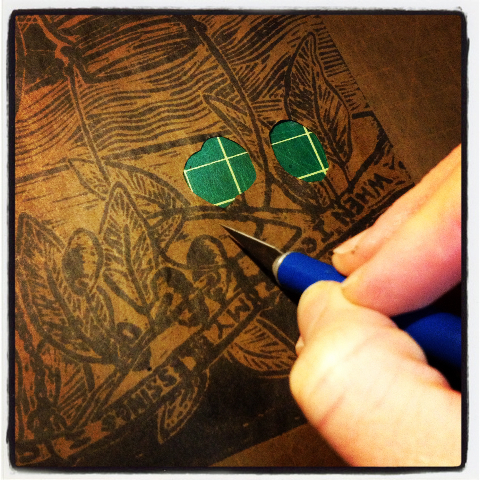 I’ve done most of my cutting by hand, usually with a pair of scissors. I can’t say this won’t evolve as I learn more but for now, I’m pretty old school. I would think the detailed process of your paper craft takes a lot of creativity. 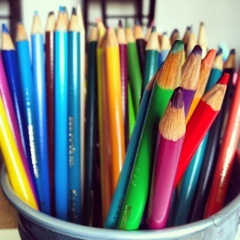 Were you always creative as kid, or did you find it later in life? I was always creative but never felt like I was very good. In college I took tons of art classes (English major/art minor) but they usually left me feeling more frustrated than inspired. Nothing I tried made the ideas in my head translate to paper the way I wanted to. Discovering a medium I could control was so exciting – but I definitely had to wait until later in life for that to happen. As someone with an art minor do you have favorite style of art? I like all kinds of art. 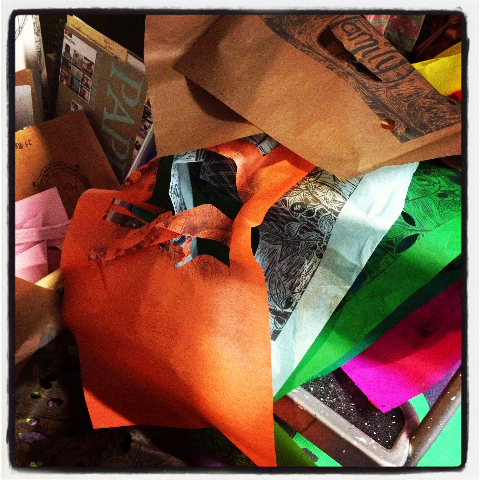 Photography, letterpress, watercolor paintings, collage, you name it! I use a lot of different patterns and textures in my work so a trip down the scrapbook paper aisle always gets ideas flowing. 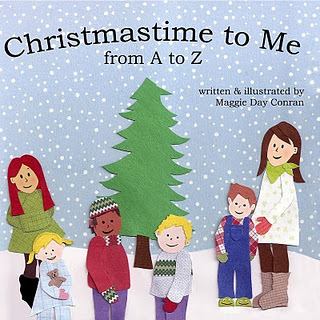 I like the cover of my first book, Christmastime to Me from A to Z, because it was the first time I attempted to recreate a character (the cover features several of the children from inside the book). I was afraid I wouldn’t be able to do it; that up until that point it was just dumb luck every time something turned out looking good. But I did it! And from then on I had the confidence to create whatever I wanted. Whatʼs the best compliment you have received about your work? Seeing a kid pull one of my books off a bookshelf and get instantly engrossed in the pictures is an incredible feeling. There is no better compliment. That has to be amazing to see, you must be proud! 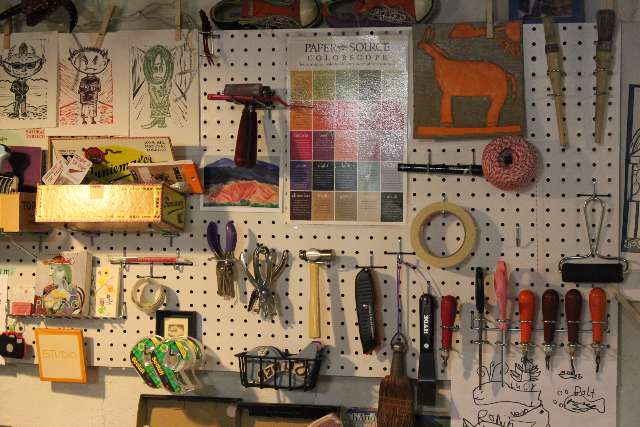 Do you have a particular work space that you can get such a craft accomplished? I created an office for myself in the laundry room! I have a long desk in front of a big window that overlooks our backyard. I can close the door which helps keep little ones out of my stuff (at least, that was the plan…) and allows me to get as messy as I need to without having to clean up when I’m in the middle of a project. 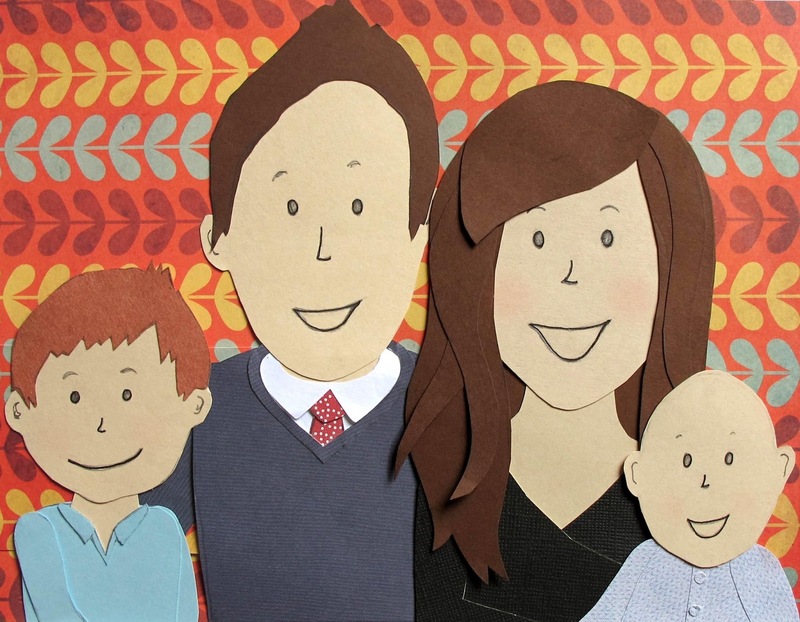 With the blog, paper cutting, and kids, what is a typical day in your life? I stay home with my two sons, Liam is 7 and Finn is 2, so my days tend to revolve around them (we started homeschooling this year). I try to fit in some creative time for myself every week but there’s definitely not a typical day at this point. At this time, my full time “job” is my family. The pay is awful but I love my work. : ) I would LOVE to make a good living writing and making art but at this stage in my life I’m not ready to dedicate as much time and energy to it as I would need to to succeed. 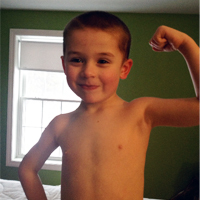 I think when my kids get a little bigger, I’ll be able to dedicate myself a lot more to my work. What are some interests or hobbies other than your work discussed here? 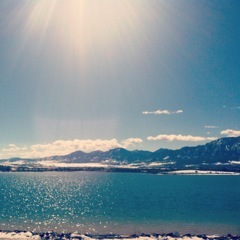 I like to read, write, hang out with my family and friends and spend time outside. What goals are you trying to accomplish right now? 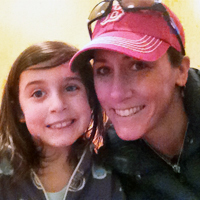 I’m sort of in an in-between period right now – still settling in to the homeschool thing I guess. But my near-future goal is to do something big with my books – like get a publisher or an agent or start hustling or something! It’s the part of the process I don’t really like – the selling myself bit. I’d much rather sit around making art all the time. So there you have it! Maggie Day Conran blogger, mommy, and paper-craft artist! You can find Maggie and follow her fantastic blog: www.nomommybrain.com. Also, find her on Pinterest, Instagram: nomommybrain, and Twitter nomommybrain. Check back for future artist interviews coming up soon and if you missed Sarah from monster in the closet last week you can see it here. Today starts my Fellow Artist Series ! I have chosen to start with one of my personal favorite block printers: Sarah, the owner of monster in the closet and her newest addition Block21 Prints. She lives in Connecticut with her husband and two kiddos. Describe you current line of creations? What inspired you to start? My current line of creations are block prints. I’ve always loved stamps and can actually remember getting my first set! (which I still have!) 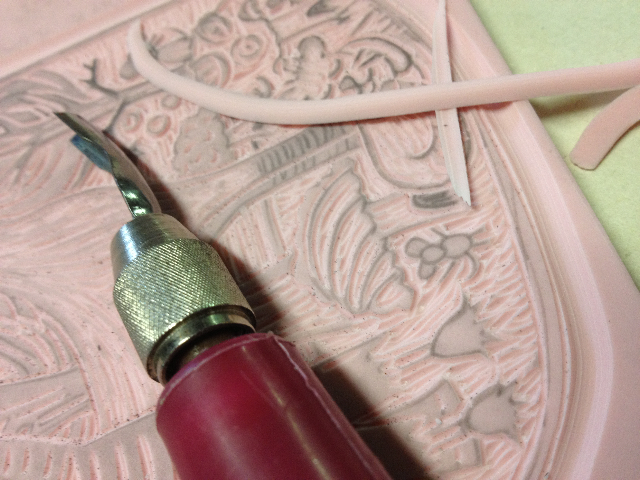 I started getting serious about linoleum carving when I was doing my masters of education with a focus on printmaking. My thesis show was a series of reduction prints with food as the subject. I’m not so sure my process is unique as relief carving has been done for centuries but I suppose what I bring to it is what every artist does, their own visions and personality. I’ve always been creative, I think that has always been my strength. My technical skills have grown and improved dramatically over the years. 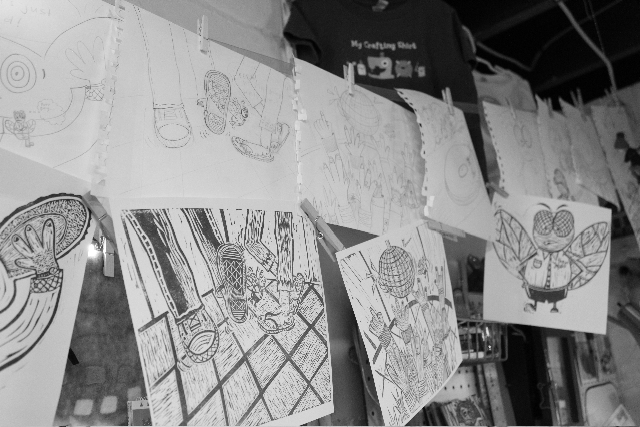 I have never been that kid in class that could draw like crazy… I’ve worked really hard at it. Honestly, I don’t know if I can choose just one style of art…I love relief prints, obviously…I’m a big fan of Hokusai and Japanese prints but I love all kinds of art. I tend to veer towards bright and colorful art (Matisse), art with tons of texture (van Gogh) but I also seriously love children’s book illustrations. Ideas come from every which direction…my brain never stops. I get ideas from music, everyday objects and my surroundings, my children and family, my students, famous artworks…you get the idea. As artist we are tough on ourselves sometimes but we are always proud at least of one thing. 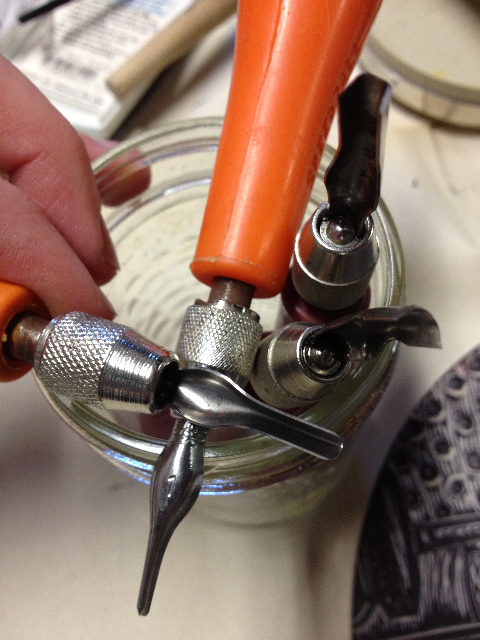 What is your favorite piece you’ve ever made and why? 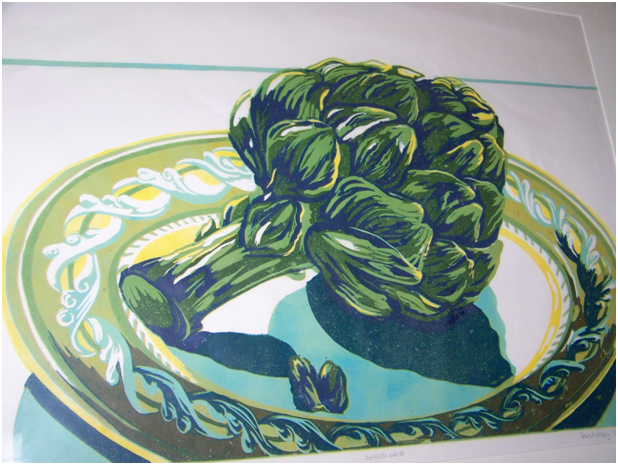 One of my favorite pieces is a reduction print I created of an Artichoke for my masters show. It was created on a piece of linoleum 18” X 24” and took me a long time and lots of sweat and swearing but in the end I was (and still am) so incredibly proud of myself. It seemed that it was the artwork that allowed myself permission to call myself an artist. That is really amazing! I am actually scared of trying a reduction print it I know what kind of work goes into it. You did a beautiful job. I seriously appreciate any compliment about my works. I think some of the best compliments come from my mom and my husband because I know they will be totally honest with me and not say nice things just because they think they should. What is a typical day in your life? Up early, get myself and kiddos out of the house, teach 6th, 7th and 8th graders art, pick up my children from school, art if the day allows, put kids to bed, fall asleep on the couch! It’s always crazy and I’m quite tired by the end of the day. I wish I had more energy to accomplish work at night but it’s just not a reality. I do a lot of work on weekends. Wow! you seem like a busy gal! Do you have any other interests or hobbies other than your art we have discussed? 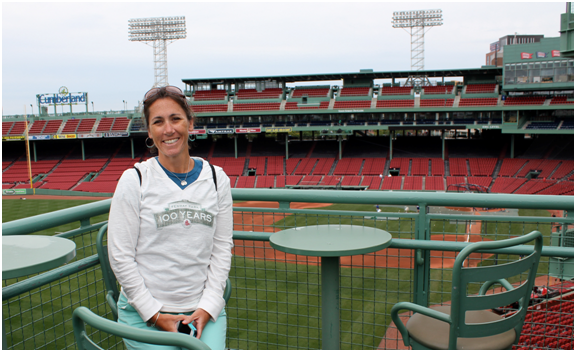 I’ve always loved sports and am a big baseball fan…go Red Sox! We have a great bunch of friends and lots of family close by so we are always hanging out and having fun. I enjoy reading, sewing and taking photos. Marianne Johansen-Ellis has two fabulous Etsy shops: Art Can Be Fun & Mariann Johansen Ellis her prints are so cool and technically awesome. I love her work! Aidan of Bubbledog has such adorable and well made items! I have numerous and continue to shop there! 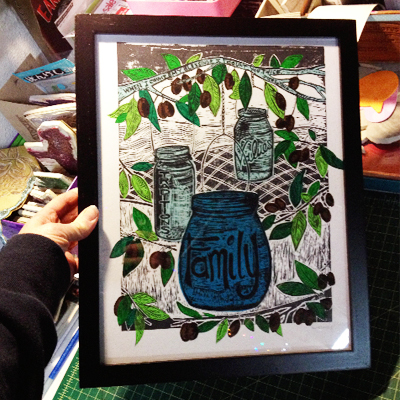 Zoe Badger of Zeebede prints has amazing linocuts! I LOVE strawberry luna’s work! It is so colorful, fun and I would love any and all of them up in my house! 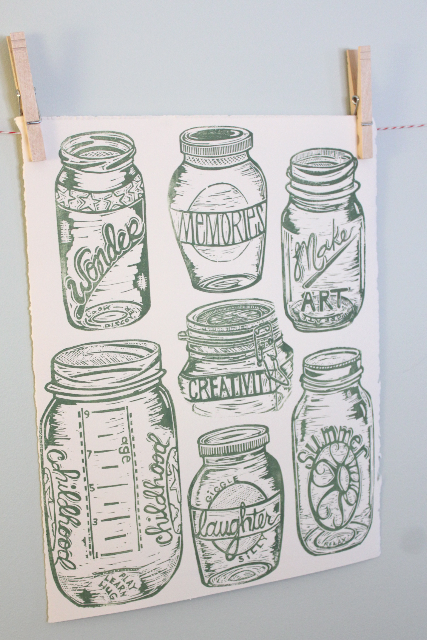 My new favorite is Fiona Humphrey’s work…I just received one of her prints and holy guacamole it’s amazing! And you know I love your shop 30 Silent Mockingbirds! Thanks Sarah! Now I have 6 more favorite artist and I’m going to have to get more walls! So I can see that from your favorite artist not only do you make prints you LOVE prints! 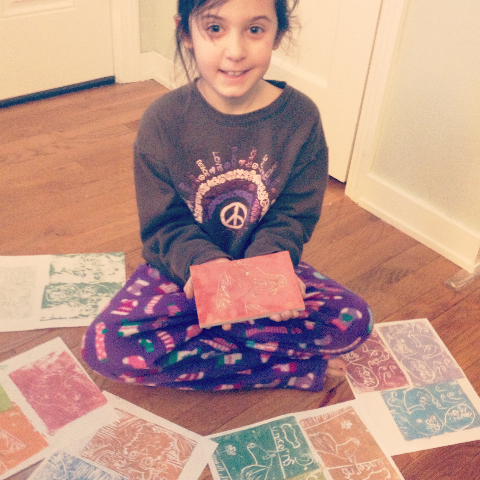 Is block printing your full time job, or do you have a job out-of-studio? This is not my full time job, I am a full time public school art teacher! 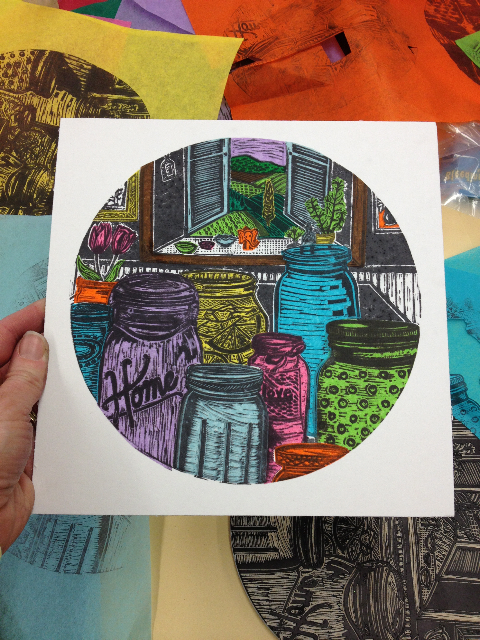 Would you ever want to be a full time printmaker? Honestly, I don’t know if I’d want it to be my full time job…artistically absolutely! Financially and stability wise, it scares me. I can understand that! I have the same feeling! With that said I know there must be challenges you face doing both jobs. Do you have any and if so, what are they? My other challenge is “knowing” the business. I’m constantly learning, trying to be efficient and find ways to sell my art. I love everything you have said here and its been so nice getting to know you! In closing, I would love to know what the future holds. What are some goals are you trying to accomplish right now? Goals? I have lists of them! My main goal is “get your art out there in 2013” and within that I have smaller goals. I’m trying to be more social media savvy, research and participate in more “calls for art,” be my own advocate, broaden my line while keeping my own style and am just trying to always make more art. I also really want to write, illustrate and publish a children’s book. I have start to write and illustrate one but am not finished and am not sure of the whole publishing process. Thanks so much for sharing what you do and answering all of my tough questions! I cant wait to share it with the world! Happy to do it! Thanks for asking me! So there you have it! Sarah of monster in the closet and Block21 Prints! Click to follow links to her Etsy shops monster in the closet & Block21 to purchase her art. Also, “Like’ her Facebook page to keep updated on her work. She can also be followed onPinterest, Twitter, Instagram. Check out her Blog that has great how tos and behind the scenes post and Website!